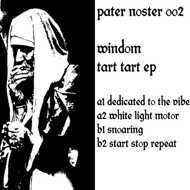 Fresh off their first release, London-based label "Pater Noster" is proud to reveal more of their world of overdriven madness by presenting "Tart Tart" the first solo release from Finnish producer "Windom". Windom made his mark on the scene by appearing on PATER001, with his rhythmic jams “At Work” demonstrating his raw and uncompromising approach to hardware techno. Built around analogue synthesisers and drum machines and recorded live to tape in a single take, Windom’s world is restless and utterly unique. Raw techno with a rough punk mentality. This time around Windom ramps things up a notch, showcasing four of his hardest-hitting techno bangers.